This time of year is always fraught with excitement and gambles on capital purchases in an effort to rise above the clutter of the marketplace. The trouble is that we’re all pretty much looking at the same products with the same hope they will make a difference. I hope my fellow vendors will forgive me when I say, “They’re not going to make a difference.” More than likely your fellow competitors will buy many of the same slot machines and likely implement the same new technology. The good news is that you already have the power to make the difference you need. You may not realize it. It’s your brand – not your logo or your ad campaign but leveraging your brand as THE business. The process of building a brand requires you to not only set a strategy and position but to “operationalize” it. More than a logo on a sign or an advertising campaign, operationalization is about how your brand becomes the culture of the organization. To quote Denise Lee Yohn, “It’s about putting your brand to use as a management tool — and getting the most value out of it.” Her book, What Great Brands Do points out “by limiting the definition of your brand to this external, surface level, you fail to realize its full business value.” The brand becomes the driver of decisions because more than just being communicated to employees, they have internalized it. In effect, it allows your brand to come to life and enables you to deliver on the brand promise at every moment of the customer journey. Unfortunately, few companies actively align the brand vision with the operations vision. Gallup’s recent State of the American Workplace report indicates only 22% of U.S. employees strongly agree that their company’s leaders have a clear direction for their organization! Why? Because a small group of executives often decides vision and purpose for the brand. The vision is then “pushed” down to the rest of the organization in a variety of ways from memos to pep rallies. The intention and hope are that it will become adopted, but the vision rarely achieves the buy-in we need because we fail to include a significant number of people as we shape the vision, purpose, and direction of the organization. If you peek into my guestroom closet, you’ll find albums upon albums. My mother loved to take pictures. I do too (though now they are all in the form of digital files living in the cloud, my computer and my iPhone). Kodak was an essential brand in our lives (even before I knew what a brand was). Looking back, it’s really easy for some to assume that Kodak failed because it “missed” the digital age. Did you know that Kodak developed the first digital camera in 1975? I think the company’s ultimate failure was because it focused too much on products and not enough on their brand. They were so narrowly focused on being a film company that they lost sight of the fact that they were in the memory keeping business. Six years after the development of that first digital camera, the company’s internal research predicted that digital would do great harm to the film business. So, the company responded by investing in digital image research and filing over 1000 digital imaging patents, continuously extolling their commitment to engineering excellence and the company’s “core competencies.” Not once did they adapt to the opportunities by reaffirming the brand’s raison d’être: helping customers savor and continue to enjoy emotional experiences beyond the events themselves…through photographs. By the time, they jumped on the digital camera bandwagon, it was loaded with competition chasing a fickle younger consumer while the company’s core fans continued to be Baby Boomers looking to continue capturing their memories. The difference between good brands and great brands can often be readily seen in the margins. Great brands tend to have above-average profit margins within their respective categories. In many ways, the operationalization of your brand can carry you from good to great. Take a look at the various rankings of great brands, and you’ll find a broad swath of companies that have created a culture around their brands: Zappos, Ikea, Patagonia, and yes, Starbucks. Great brands like these can even recover from a crisis a little easier because they’ve built solid branded operations and decision making. Tylenol is a classic example. The brand is built around pain relief, but health underlies everything they do. So, when a few of their bottles were laced with cyanide, Johnson & Johnson immediately issued an enormous recall. The brand ethos served as a guiding light in all their decisions. Although their market share took a short-term hit, they were able to grow back successfully. Employee Retention and productivity are additional benefits of operationalized brands. 37signals, parent of a project collaboration software called Basecamp, has cultivated a distinct culture based on their brand – making collaboration productive and enjoyable. With a small number of employees, they have created such traction around their values and operations that they can be more efficient and effective – lowering the costs of recruiting, retention and motivation while benefiting from a high revenue per employee measurement. Start on the inside. Operationalized brands cultivate a strong culture of stakeholders to influence everything that is done. Gather a “Brand Trust Group” (my play on brand and brain trust) from the enterprise. This group should be front-line and back of house employees. Through facilitated sessions focused on what is working, you should discuss the organization’s strengths and aspirations. You should be able to identify the brand attributes that can become trainable behaviors that can, in turn, reinforce the brand in practice as well as influence future strategy. When Sam Palmisano took the reins of the beleaguered IBM in 2002, he inherited a company that had lost its cachet and was often viewed as increasingly irrelevant. The easy route would have been for him to overhaul the company’s marketing strategies – put a fresh face on the company and its products. Advertising IS the fastest way to get attention, but Palmisano understood the best way to reset the organization and strengthen the brand was through strengthening the culture so that employees could turn the brand promise into breakthrough customer experiences. IBM’s process of operationalizing their brand turned the focus from products to people. Make superior choices grounded in your brand. Don’t chase trends that are not suited to your brand. Decide what you will or will not do based on the brand’s guiding light so that you will attract customers rather than chase them. By being transparent and consistent about who you are and what you stand for, you’ll attract the customers that fit your brand. Sweat the details that will continually enhance the operation. Patagonia sells high-end outdoor gear and clothing. It started in response to the simple need of the founder but has grown into a global company that has preserved its ideals while growing exponentially, incorporating transparency throughout the supply chain and remaining loyal to the trust customers have with them. One remarkable campaign found them eschewing the wild consumerism of Black Friday. Instead of promoting sales, the retailer encouraged people NOT to purchase new items but to repair their existing belongings. With the hashtag #BetterThanNew and #AntiBlackFriday, Patagonia brought its brand essence of responsible living to the forefront on one of the biggest shopping days of the year. Continuous improvement through measurement. Identify expectations that can be measured through a balanced scorecard framework that provides financial, customer, operational and employee metrics. Benchmark at the start and continually analyze throughout the process. An executive leadership commitment is necessary, but company-wide engagement is a must. 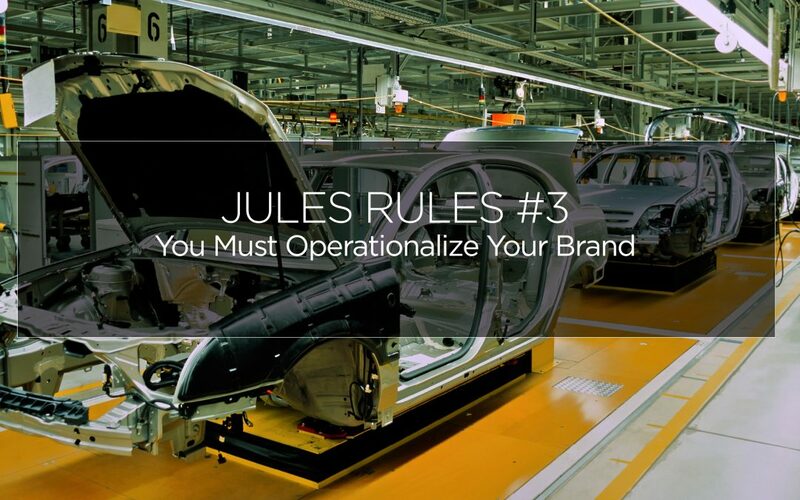 Operationalization of the brand cannot be relegated to the marketing department. By the same token, marketing cannot operate in a vacuum creating communications and programs that do not reflect the operation. Adequately operationalized, the brand will shape business objectives as well as direct strategic planning and allocation of resources. It can identify new opportunities as well as those that are not well suited. It will allow your team to focus on the right things and will foster alignment. Think about the most remarkable brand experience you’ve been a part of recently. It could be opening a package delivered to your door. It could be visiting LEGOLAND or the SPAM Museum. What made it remarkable? What stood out to you and why? How do you make your operation extraordinary? A shortened version of this column appeared in the October 2018 issue of Casino Journal.